For the World Week for the Abolition of Meat, we set up another information stall on Sunday, January 30th so as to raise awareness about animal rights and the idea of meat abolition. The action was much more successful than the one we put together on the day before as our stand was located on the Salins marketplace, and many people stopped by. We were very pleasantly surprised by the positive and open-minded response we got. 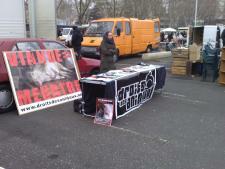 We met a number of people who had stopped consuming animal products. We had very interesting and courteous conversations both with people who supported the idea and with people who were totally against it.